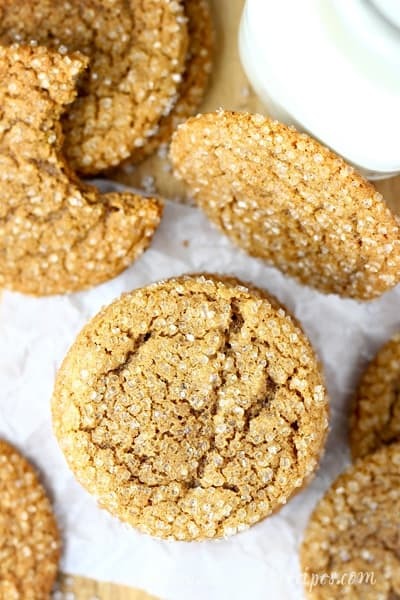 FOUR SPICE CRACKLES — Chewy, gingersnap style cookies with cinnamon, cloves, ginger and nutmeg. Perfect for the holiday season! Sugar and spice and everything nice, that’s what these Four Spice Crackles are made of. If you only make one cookie this holiday season, it should be this one! 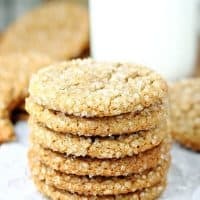 These cookies are one of our all-time favorites, and one of the first recipes I ever shared on this blog. I still get compliments on them all these years later. As delicious as they are, I always hesitate to make them at Christmas time, thinking such a simple cookie can’t compete with all the other fancy offerings that show up during the holidays. But I couldn’t be more wrong. Just this year, my 17 year-old declared they were still his favorite, out of all the holiday treats I make. They’re kind of my favorite holiday cookie too. 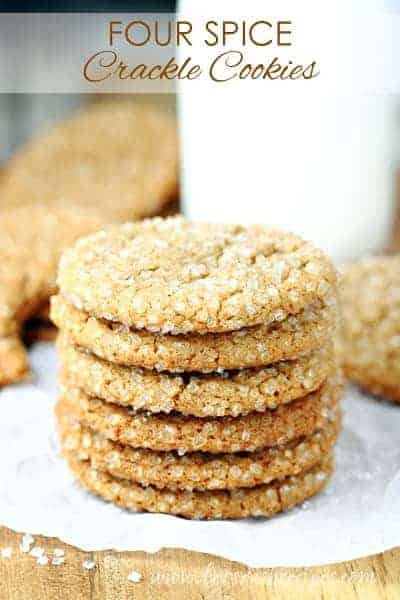 Loaded with holiday spices like cinnamon and cloves, and rolled in coarse sugar for some festive sparkle, this is the kind of cookie that’s always going to be a classic at Christmas time. 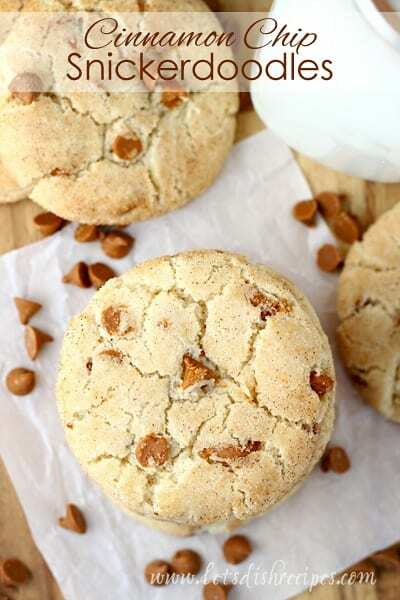 These gingersnap-like cookies are loved by kids and adults of all ages. I think it must be the wonderful gingerbread-like aroma. Or the perfectly chewy texture. YOU HAVE TO STOP! We made these yesterday to see how they were before making them to send in a care package. Like cookies need a trial run right? I could not stop at just one. For the softest cookies, make them big and bake them for about 8 minutes. If you like a crispy gingersnap, make them a smaller or bake them longer. I recommend removing them from the oven as soon as the tops start to crack. You definitely don’t want to overbake these cookies. And if you can’t find the coarse, sparkling sugar, regular sugar will work just fine. 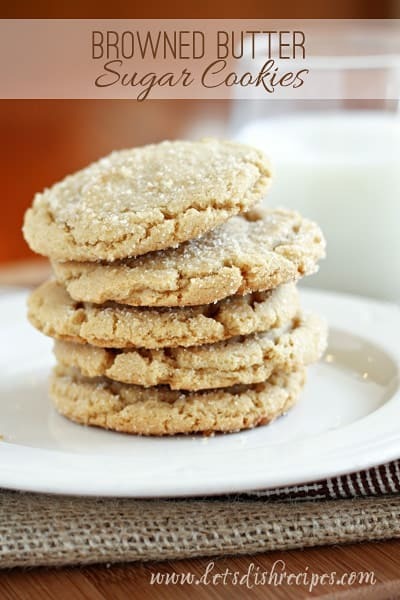 Be sure to save this Four Spice Crackles recipe to your favorite Pinterest board for later. Chewy, gingersnap style cookies with cinnamon, cloves, ginger and nutmeg. Perfect for the holiday season! Add eggs, one at a time, beating well after each addition. Beat in molasses. Combine the flour, baking soda, salt and spices; gradually add to creamed mixture. Refrigerate for 30-40 minutes, or until dough is easy to handle. Roll dough into 1-inch balls, then roll in sugar. Place 2 inches apart on lightly greased or parchment lined baking sheets. Bake for 8-10 minutes, until cookies are lightly browned and cracked on top. Cool one minute before removing to wire racks. These look so good. I am going to make these for Christmas this year. You should link them up to http://buttercreamlane.blogspot.com/2009/11/25-days-of-christmas-cookie-recipes_27.html . It’s a collection of cookie recipes for Christmas. i have been a terrible blogger buddy- but i am back again with merry mondays! hope you will join and hope all is well with you! 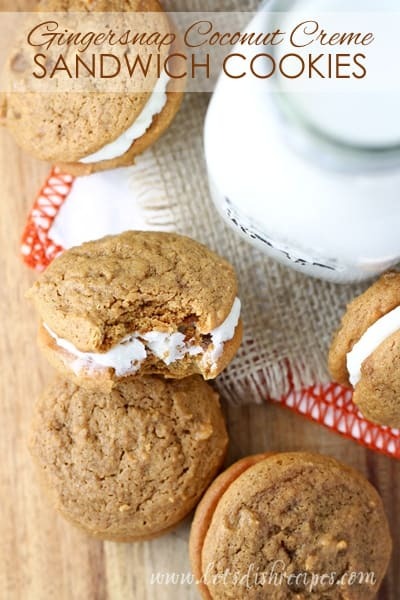 these would be the perfect addition… as well as that cream cheese dip… woooow! I made these and they didn’t come out like yours 🙁 They were yummy but they weren’t fluffy or crackly. I think the problem might be that I put 3 eggs in by accident? Oh well, they were still yummy! Great recipe. I loved them and so did everyone I shared them with. Thanks!